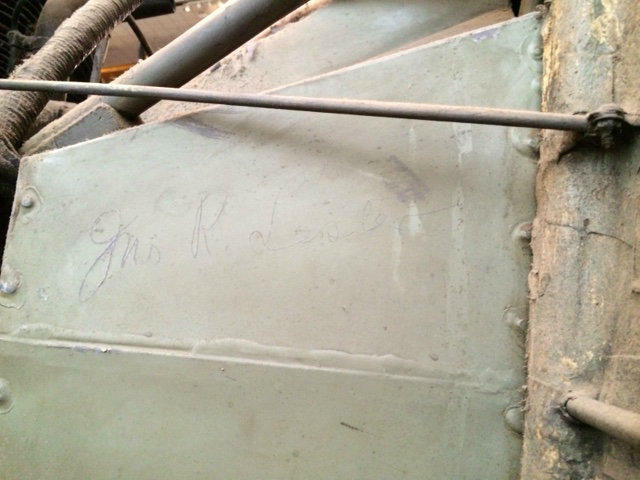 Dust will have to be carefully removed from the Spirit of St. Louis. The interior also will be cleaned. 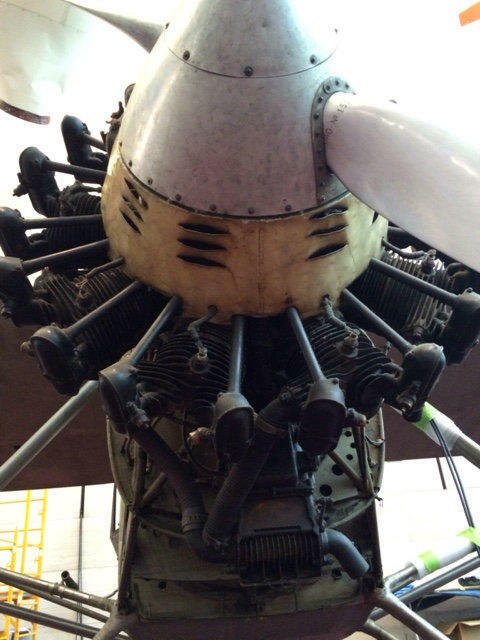 Contractor Karl Heinzel examines the engine of the Spirit of St. Louis. 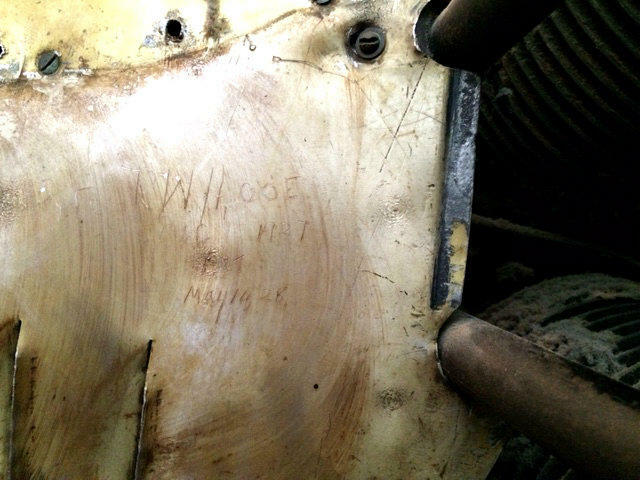 Names have been scratched into the plane's surface. Contrary to what many people think, the plane is not made out of aluminum sheet metal. Instead most of the plane is covered in a cotton fabric with cellulose nitrated dope with aluminum powder mixed in. Collum says the exposure to light is just one of the drawbacks of ensuring that such an artifact remains accessible for public viewing for generations to come. 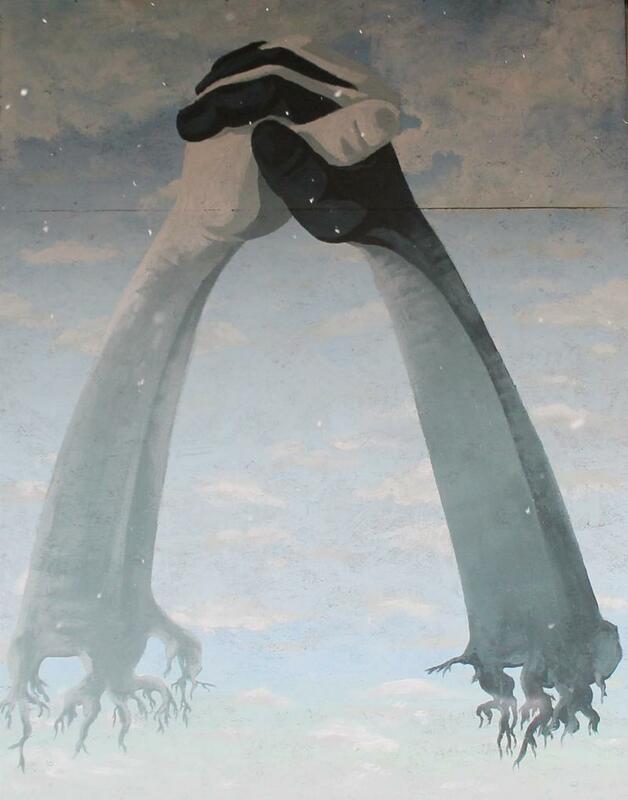 “My desire would be to have this locked away in a very dark room,” he said. 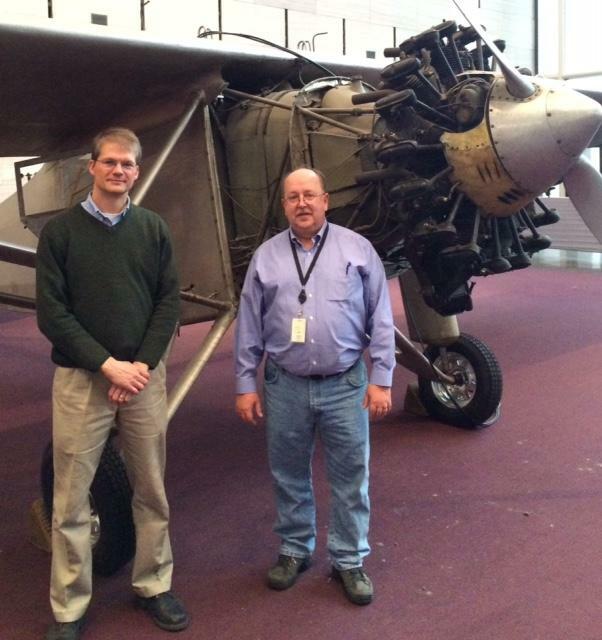 "St. Louis on the Air": Jim Howard and Susan Smith, curator of civic and personal identity at the Missouri History Museum, talk about Charles Lindbergh and the Spirit of St. Louis. On May 23, 1927, just two days after Lindbergh arrived in Paris, the Smithsonian sent the young pilot a telegram requesting the plane. “To our surprise and delight, he agreed to it once he finished his tour of the United States and as long as he had the agreement of his backers in St. Louis,” said Bob van der Linden, the chairman of the museum’s aeronautics department and the curator of the Spirit of St. Louis. Lindbergh and the Spirit of St. Louis arrived back in the United States aboard the Navy cruiser Memphis on June 11, 1927. “President (Calvin) Coolidge wasn’t about to let Lindbergh fly back, just in case he wouldn’t have as much luck on the way back as he did on going over,” van der Linden said. After stepping off the ship at the Washington Navy Yard, Lindbergh told the crowd that the U.S. should work to develop commercial aviation. “What we need now in America, I believe, probably more than any other thing to develop our aviation is a series of airports in every town and city in the country,” Lindbergh said. In doing so, he helped launch the push for commercial aviation in this country. The Guggenheim family paid for Lindbergh’s three-month tour flying to cities across the country to promote commercial aviation at each stop. Shortly after he completed that tour, the federal government requested that he do a goodwill tour through Central and South America. It was on that goodwill tour that individuals from countries along the way painted their country’s flags on the aluminum engine cowling of the plane. One challenge for Smithsonian’s preservation team is that many of those small painted flags are now cracking and flaking off the aluminum. “Some of the flags are actually missing quite a bit of paint, and the decision of whether to go in and actually compensate those losses is still up for debate,” said Collum. The problem of the flaking paint on those small flags poses a big question for the museum. “Do you preserve it and make it look nice and shiny, just the way it did — then it’s fake — or do you let it fall apart?” asked van der Linden. “It’s a very fine line and we’re going to have to look at it closely before we make up our minds about that.” Van der Linden says the first goal is to preserve the “originality” of the plane as thoroughly as possible, recognizing that manmade objects deteriorate over time. Conservators use what Collum describes as a pallet of “reversible synthetic resins and materials. “With the little flags, we’re using the same kinds of principles and techniques that a fine art conservator would be using on a painting.” That means that any repairs done now will be completed in such a way as to allow them to be undone in years to come without causing more damage to the original work. All but invisible to anyone not extremely close to the plane are signatures and initials scratched into the aluminum, both inside and outside of the plane. Names and initials dot the plane. With the possible exception of the rubber on the ignition wires, the engine has been preserved with the potential of running again, said Collum. Part of the work on the plane will be to drain preservation oils put into the engine years ago and replace them with modern synthetic oils to prevent corrosion for decades to come. “We’ve pulled off a few spark plugs and looked inside and the bores are amazingly clean, I haven’t seen a bit of corrosion in the cylinders,” said Collum. Visitors to the museum quickly notice the bright chrome wheels on the plane. They’re not the original wheels, but are used to move the plane around while it is on the floor. The original rubber tires are nearly 90 years old and were removed as the plane was lowered from the rafters to ensure that they didn’t burst under the weight of the aircraft. While all of the cloth on the plane dates to 1927, not all of it was actually on the plane when Lindbergh flew from New York to Paris. Many of the thousands of French citizens who crowded around the plane when it landed at Le Bourget Field tore pieces of fabric from the fuselage for souvenirs. “The French Air Force was so embarrassed by this that they whisked the airplane off into a hanger,” said van der Linden. After initially trying to patch the many holes in the original fabric, French officials decided to “replace the cloth on the fuselage from behind the doors on both sides of the plane back to the tail with French linen,” he said. Charles Lindbergh never wanted anything to do with the big anniversaries of his famous flight. “He’d try to be out of the country,” said Reeve Lindbergh, Lindbergh’s youngest daughter. But she said he was very fond of what she calls the Spirit. “He used to go and very quietly visit it from time to time,” she continued. “I think he often wasn’t recognized — he would wear glasses, which he didn’t need, and a fedora and a pinstriped suit and he would just go hang out” with the plane. One indication of the bond Lindbergh felt for the Spirit of St. Louis can be found in the name of his first book on the 1927 flight: “We,” a reference to himself and the plane. 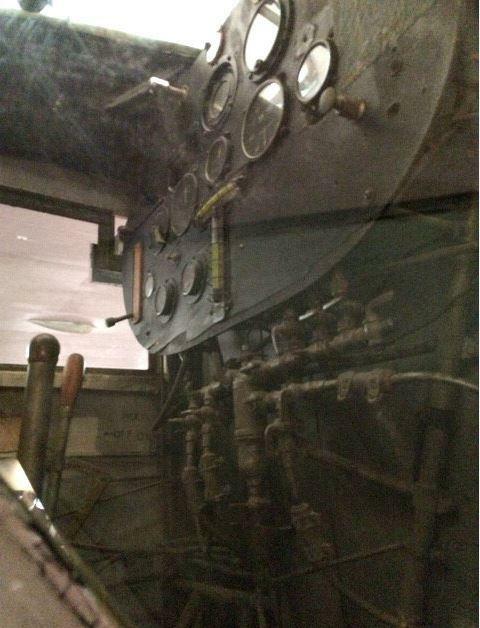 From 1928 to 1975, the Spirit of St. Louis was on display at the Smithsonian’s Arts and Industries building. In 1976, the plane was hoisted into position in the Air and Space Museum’s main lobby along with other iconic air and spacecraft. In the winter of 1965, Lindbergh took his family to Kenya and Tanzania, where “he had been teaching individuals there to fly to do aerial monitoring of their own poaching situations … He was doing something quite wonderful having to do with preserving the natural environment through the use of aviation technology,” said Reeve Lindbergh. Reeve Lindbergh is the honorary chairwoman of the Lindbergh Foundation, which is working with groups in Africa to train and deploy drone teams to monitor poaching. Foundation Chairman John Petersen said the organization is in the midst of a fundraising campaign to raise a half-million dollars to expand the number of drone teams in Africa as part of its Air Shepherd project. “These little airplanes have infrared camera systems on them so that they can see the poachers at night and rangers can be called to arrest poachers before they kill the animals,” he said. Petersen says the foundation is working with UAV Drone Solutions, an African company that has invested $2 million and flown 600 missions with drones. No animals, rhinos or elephants, have been killed in areas when and where the drones have been flown, Petersen said. “This is a project that works, we’ve tested it and it is the only way that poaching literally stops when we fly these airplanes,” he said. As St. Louis celebrates 250 years, several books have explored the city’s history. Add one more to the list, but this one tells the tales through timelines. “St. 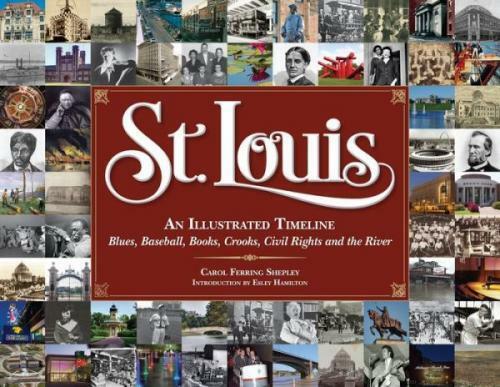 Louis: An Illustrated Timeline” offers a tour through St. Louis’ past (and future, as the book ends in 2016) with vignettes for noteworthy years. It also has what author Carol Ferring Shepley calls a “wide-angle view” of the city. Since 1966, The Arch has represented St. Louis as the Gateway to the West. But it also has other connotations, especially now.